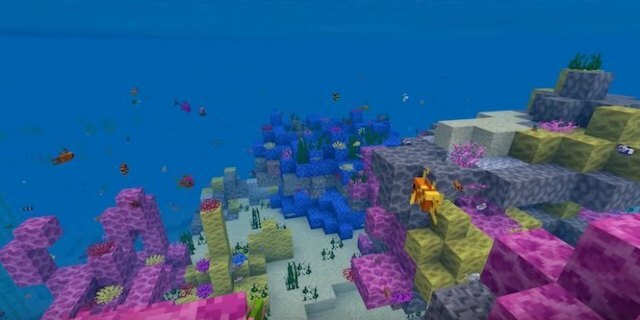 Minecraft’s recent Update Aquatic now enables users to go under water, allowing them to explore coral reefs full of creatures. However, there is more to this update then merely entertaining gamers; the producers of Minecraft, Mojang, have taken this opportunity to promote their environmental concerns over the destruction of coral reefs. Real world oceans are suffering; pollution is killing sea life, in particular coral, which despite occupying less than one percent of the ocean floor are home to more than twenty-five percent of marine life, according to the Coral Reef Alliance. The destruction of this habitat is alarming. Minecraft are therefore aiming to tackle this by creating sculptures made from BioRock, an innovative technology that promotes coral growth up to five times faster than normal. The sculptures have been designed by public figure StacyPlays, Minecraft creator LogDotZip along with Mexican School children. Donations to the cause are triggered when players build coral or buy custom content in the game. In the first two days alone, ten million coral blocks were placed underwater in-game, which triggered the donation from Minecraft to The Nature Conservancy’s efforts to restore and protect coral in the Caribbean.